Valley School of Gaming 300 Chips Set. Valley School of Gaming Located in Las Vegas, Nevada. 39mm Chip with H&C Paulson Molds. The Breakdown is the following. 50 - 25¢ White Casino Chips. 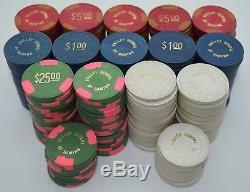 All the chips are in good and great used casino condition. The item "Set of 300 Valley School of Gaming 25¢-$1-$5-$25 Poker Chips Las Vegas Paulson" is in sale since Tuesday, October 24, 2017. This item is in the category "Collectibles\Casino\Chips\Sets\300".